I will start by giving you a brief background to our story. My husband, Jack and I are the proud parents of three sons, Zachary age 24, Sheldon age 22, and Gavin age 16. We were like any typical Canadian family, hockey on Saturdays, baseball in the summers, church on Sundays, and Mc Donalds drive thru after groceries. Then epilepsy struck our family, after the birth of our third son, Gavin. I had a fantastic pregnancy, worked till my due date, and had a quick,easy delivery. We were discharged home the day after he was born, and Gavin proved to be the easiest of them all. A healthy weight, easy to feed and very content. We went camping at 2 weeks of age, and again at 6 weeks of age, and he was just pack and go, no issues. He had his 2nd immunizations in December, and one week later he had his first seizure. Our lives changed forever on that December day of 2001. He had a tonic clonic, hemi clonic seizure that lasted 40 minutes, and by the time we arrived at the hospital by EMS he had stopped seizing on his own. His temperature on arrival was 38.2C , so very low grade if any temperature given the fact that he had such a long seizure. We lived out in the country, so the paediatrician felt it was wise to stay overnight, in case he had another “febrile seizure” so we were admitted to the hospital. That night he had another 40 minute seizure and while administering his first medication, phenobarb, he went into respiratory arrest. We were transferred to Mcmaster University Medical Centre, and spent a week there . He continued with hemi clonic twitching, and after some time it was decided he would start his first daily seizure medicaiton. We were discharged home with instructions to follow up with an EEG and monitor his seizures. This was such a stressful nd devastating time in our lives, to think our newborn son had SEIZURES! I worked in the ER and had seen lots of seizures, and always thought, “dear Lord, I can handle anything but not a child with seizures, they are so scary!” and here I was with a baby with seizures. All my friends were talking about their babies with diaper rash and sniffles that kept them up in the night, and I was afraid to sleep because what if he seized in the night and I slept through it/ If he slept quietly I panicked and rushed to his room if I had fallen asleep, and if he twitched or seized I also panicked that he would not survive another seizure. It was a very tough time for our family. Unfortunately, the meds were not effective, and we quickly required a new med and a wean from the first. This was our first indication that there was something wrong. Here was our beautiful, chubby , happy baby who continued to twitch and tremors, and who would have a tonic clonic seizure with the slightest temperature increase. A low grade fever, a hot bath, to many blankets, and he would start to twitch and become very irritable and upset. The EEG was inconclusive, and we went home again. 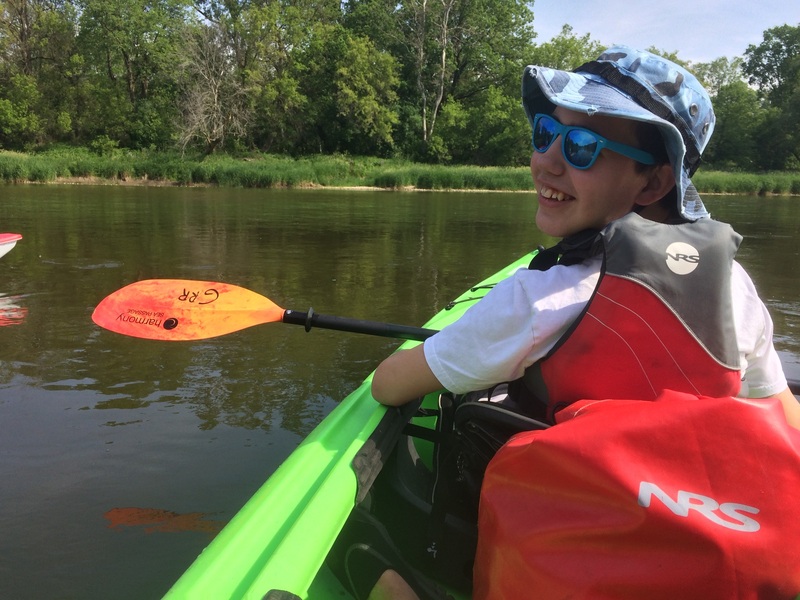 We continued on this road of frequent hospital visits, doctors appointments and always hearing the same, “he looks so good!” but he has epilepsy. By age 2, it was obvious there was more to the picture, as he had major speech issues but again we were told “he looks good!’ he will catch up. In the spring of 2005, we had a sudden deterioration in his condition. He would now have unprovoked seizures, prolonged, and they included tonic clonic, partial complex, atonic, hemi clonic, and hundreds of focal seizures a day. His behaviour was horrible, he screamed for hours every night and had lost the ability to walk and talk, as well as having numerous head and body injuries. We were desperate, the only option given to us was another medication (number 7 at this point), which was used as a veterinarian medication and showed great promise for paediatrics but no clinical trials were done. How was that an option?? I find this hard to believe, but we really considered it, as we were desperate and that’s what was recommended by our neurologist. There really was no other options. We had tried and failed so many medications and with every new introduction there was a corresponding wean and new side effects that sometimes required more meds. A vicious circle. Surgery was not an option as his EEG showed such generalized patterns. We had uncontrollable rages, head banging, hair pulling, head slapping, and high pitch screaming, hours of sleeplessness then a tonic clonic seizure, then an exhausted post octal period and then start all over again. Some days he had 7 tonic clonic a day with hundreds of other focal seiures. It was a horrible time for us all, and Gavin’s siblings were devastated by what was happening to their little brother. We would take the ambulance to the hospital, and told by the EP “why do you keep coming back, you should learn to control the seizures at home”, we felt helpless and hopeless and our son was slipping away day by day. After another transfer to MUMC< we reached bottom when we were told to take our son back home and keep him as comfortable as possible, and the palliative team would be contacting us for discussions. How could they ask us what we wanted done if his heart stopped or he went into respiratory arrest again , when 3 months before he was running around, happy and laughing, just a little guy with “epilepsy”? We took him home, and cried the entire way home, then had to face our other sons and assure them that somehow, someday Gavin would be better. The final straw was just a few days later, when Gavin had an atonic seizure , and when I picked him up he was unresponsive and covered in blood. My 8 yr old called 911 and was so upset he could not answer the dispatchers questions, and my 6 yr old was screaming and sobbing beside him. I was frantic, I hung up the phone and planned to drive with a seizing baby on my lap to the hospital. Gavin had his rescue meds at this time, and then he became very blue so I called 911 again and waited for an ambulance, while I assisted with his breathing. When we arrived to ER, we had hit bottom. My other sons frantic, I was hysterical and I knew we had to do something drastic. Gavin had knocked out two of his front teeth, and would require surgery to have the removed, and we started to plan for a transfer to MUMC> When the EP called there, we were told there was nothing more they could do, and we should wait for the palliative team to connect with us. I called my husband and told him “pick me up , we are going to Sick Kids” ( I had researched the ketogenic diet and was very eager to start this, but due to lack of funding for the program and a long waiting list MUMC was not able to offer the diet. I told the neuro team that I was doing the diet , with or without their assistance , as it really was the only option for us. They were adamant that we had to have medical oversight for the diet, and I had to wait till it was Gavin;s turn on the list). In my heart I knew that I did not have the time, not a month, not a week not even a day. I needed it NOW! We arrived at HSC with dried blood on out shirts, and emotional wrecked parents and a post ictal baby, who a que had another tonic clonic seizure in the ER. That ’s one way to get a neuro consult quickly. And that’s when our lives changed, when we met Dr Jeffrey Kobayashi, the neuro on call and the ketogenic diet team doctor. By the time he arrived, Gavin was awake again, and we begged and pleaded with him to help us. We had no other options and we were losing our son. He left the room and when he returned he had Chrisitana Liu with him, the dietician, and they agreed to help us . What an answer to prayer, even though they were full with other kids, and it was coming up to a long weekend they agreed to take us on. We went back home to pack and get ready to be admitted. The next day as we drove to Toronto , I remember thinking “I HATE COOKING” but I would do anything for Gavin and I had faith in this special diet. I was so grateful to learn the diet, but it was a big stress and I didn’t know if I was smart enough to do it, as i usually want to spend as little time in the kitchen as possible. Anyway, I was smart enough and the diet started. Within 1day we had gone from 5-7 tonic clonic seizures a day and 100’s of focals, to no vocals and one TC in 24 hrs. His body was calm for the first time in 4 months and he rested! We were discharged June 30and started the diet on our own on July 1, 2005. It was scary and intimidating and AMAZING to watch our little Gavin come back. We worked hard to re learn walking, talking, toileting, and smiling and happy again. What we had lost in months, took months to get back but he mastered it all again. We were on the road to recovery thanks to Sick Kids, and this amazing diet. Initially it took total concentration and quiet to prepare the menus, (virtually impossible with 3 kids), so most meals were prepared at night when the kids were in bed. I became more confident, and we went camping with our weigh scales, tupperware containers and oils and whipped cream . We tried to keep as normal a life as possible for the other boys after the trauma they had gone through, Keto in the trailer was a challenge, if someone walked in to the trailer onto the step the scale would unbalance and we would start again. We hiked with giant cooler bags that had his meals and meds in them, and if he was scheduled to eat at 1200, we sat down on the trail and ate lunch wherever we could find a spot. We had seen a 100% reduction in focal seizures, and 75% or greater reduction in tonic clonic seizures so we followed the diet and the rules completely. We had many interesting and unusual experiences since we started the diet and I will share a few. On one of our trips to Florida, we went through customs at the Buffalo airport. I always carry a letter from HSC stating that he needs his own foods with him,, and this is usually sufficient for the border patrol. But not this time, we had the patrol that did everything according to the book, and he took all the containers out of the bag and set them on the counter. When he was a little rough with the liquids , I reached over to grab it, and he immediately grabbed his holster with his gun, and said in a booming voice, “Ma’am, keep your hands back and do not touch anything here!” A little intimidating! When Gavin turned 8, he was adamant that he wanted a birthday cake…..this was so sad to hear because how would I make a cake with lettuce, butter and chicken?? On further investigation however, it was not the cake he wanted but the candles, so that year he had a brand new Tonka truck, packed with sand and topped off with 8 sparkling candles! You may wonder why he is still on the diet after 13 years? It certainly was not in the plans, we wanted to be done with it after 2 years, and hopefully would have achieved seizure freedom. It did not work out that way He never achieved seizure freedom on the diet, as a matter of fact he became very sick again when he was 9 with abdominal epilepsy. These seizures were horrible to watch, and he was suffering daily with them. He would have a sudden severe pain sensation to his epigastric and chest area, that made him panic and gasp and he was so afraid he was dying. He would clutch at his shirt and chest and throat, and eventually turn blue and progress to a tonic clonic seizure. All our hard won victory with seizure control and balance of meds was in jeopardy. And once again I was convinced that Gavin did not just have epilepsy but that we were missing a piece of the puzzle. I finally convinced a doctor to do the genetic testing at MUMC and in a few weeks we had our answer. We were right, he had DRAVET SYNDROME< a very bittersweet moment. A victory we did not want, as our faint glimmer of hope that he would be cured, was now gone. I also had a test result now but no doctor to manage this, as the doctor who tested him said, “if it comes back positive then you have to find someone to follow him, as I am not a neurologist and this is not my area of expertise”. Again, I turned to HSC and once again Gavin had a well timed tonic clonic seizure in the ER and this time we met Dr Minissian. His first words were , “what can I do to help you?” I showed him the test results and explained how the testing was done, and that I wanted him started on DIACOMIT a medication specific to DS. He was most willing to help and we went home again with a plan, a script, some meds and HOPE for a brighter future for our son. And Gavin became SEIZURE FREE – after 9 years, 1000’s of seizures, countless meds and pokes and prds. Since then we have been blessed with 4 years of seizure freedom, and a little boy who has grown into a young man. He is now 13 years old, in grade 7, reading, writing, runs 1 km per day, has a quirky sense of humor, and a small circle of friends and he is healthy. We weaned off epival, topamax, and recently keppra, which lead to his first tonic clonic seizure in 4 years. We have maintained the classic ketogenic diet and also started him on a pure CBD oil, as well as the DIACOMIT. We have thought many times to wean the diet, but it is good brain food, high in fat, and his lab work reflects a good tolerance to it. He loves his meals, and has adjusted to a life where food is not the main attraction. If we were to remove it now, and had to re instate it later, it would be very difficult for us all as he is aware of limits. Now for the actual meals, As I stated earlier, I don’t enjoy being in the kitchen so I try and streamline the process. I usually prepare a batch of meals, which takes 1-1/2 hr but takes care of the next 4-5 days. When we renovated our kitchen, we bought a fridge capable of storing all his meals, and now have a full size fridge with a full size freezer beside it. I try and use the same ingredients throughout , so if he has oranges for breakfast he also gets them for snack and at meal time. I rotate between 3-4 menus, and there is little variety. The only issue he has is large pieces, and he has never mastered the skill of chewy food or big pieces, he prefers his meals cut in to small pieces. For special occasions now i use ketocal or ketocuisine powder and make pancakes or “cakes” for his birthday or on holidays. He calls them Helen;s pancakes as she made the recipes for us……At school , he eats on schedule, and his teachers are very accomodating. When the other kids and its not his time, he has lego or puzzle time. His classmates also bring him little gifts from the dollar store on their birthdays if they have fold treats for their classmates. He is thrilled with this. His meals are a variation of breakfasts, day snacks, bedtime snacks and meals. He has eaten egg whites for bedtime for 10 YEARS!!! To you and I this would be boring, but he has been on this since age 3, so he has no problems with it. He has a very limited memory of REAL FOOD as he was so sick then, so he does not know any different. We try to focus on his day and activities at meal times, and eat all together as often as possible. He also has cheated in the past, but lately when he cheats, it means grabbing an extra grape or piece of watermelon, instead of a cookie or chip. We have been on a variety of ratios over the years on the classic diet. Changes in the ratio are only done once , maybe twice a year with the direction of HSC and calories are also increased according to his height and weight. Every change is with their approval, and we have a great working relationship with the ketogenic team. We tested blood sugars and urine ketones with changes and with illness, but when we are stable we do not test as often. In times of illness we monitor closely, and have protocols set in case of diarrhea, vomiting, fever, or infection. We also do routine lab work and this keeps his general healh very stable over the years, a lot less colds and sniffles then my other sons. We have travelled this road for 13 years and it has now become a part of daily life. The entire family eats much healthier, we don”t go through McDonalds drive thrus after groceries anymore, and our overall knowledge of food has grown. Gavin continues to have periods of struggle and periods of relative calm, where the seizures are better controlled. He has taught us much and we hope our story will inspire others to always support and fight for your kids and know there is always a ray of sunshine in every day!